Whether depicted in a scene from a movie or perhaps as observed in a real-life situation, many individuals can identify with scenarios in which the human is clearly the submissive partner in the dog-owner relationship. The dog does whatever it wants, gets whatever it wants, and takes whatever it wants, while its owner or owners merely observe or simply cannot seem to influence or curb their dog’s behaviour in any way. In either a comedic or sarcastic sense, outside observers might be heard to remark that the dog has its owners well-trained – and, in a way, they would be correct. Likely due to inadequate or non-existent dog training by the owners, that dog has assumed the ‘alpha’ or dominant role in the relationship and the consequences of such a hierarchy can be, in a word, catastrophic. It is well known that, at a primitive level, dogs are pack animals. And within the mindset of a pack is the natural/biological need to have an established leader. In the owner-dog relationship, there is an inherent pecking order for the owner to assume the role of pack leader; however, if this is either ignored or not actively seized by the owner, the dog will intrinsically step into the alpha position. From an overall perspective, it is more appropriate for dog owners to use a collaborative yet assertive approach to establishing themselves in the role of pack leader, rather than the stereotypical drill sergeant methodology of barking (pun intended) commands/orders and imparting the dominance of rank/title over their subordinates. In other words, using positive reinforcement versus instilling fear and/or the threat of punishment will yield far more successful results in any/all dog training efforts relative to positioning its owner as pack leader. Set boundaries within the home – restrict access to certain rooms, the furniture, etc. 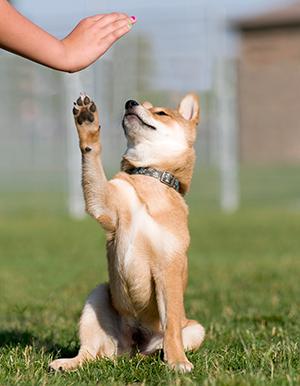 Include fun in dog training – avoid an all-work mindset; praise, reward, and play too! Establishing oneself as the pack leader should be independent of the dog’s age, breed, or any previous ownership; from puppies to adopted/rescued dogs to older dogs who were not provided with any obedience school training, owners can and should work toward the goal of achieving the alpha position within the relationship. This will not only provide the basis of a stronger and more rewarding connection for the owner with his/her pet, but it will actually lead to a happier, healthier, and less stressful life for the dog as well. As noted above, dog obedience training classes are a fundamental step/requirement to positioning the owner as the alpha/pack leader within the relationship. In fact, enrolling the dog in obedience school should take place very early in the overall process, as it will set the stage for all future/extended training as a dog continues to assimilate/fit in with its new home and family. 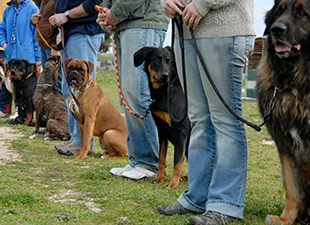 To aid in establishing your role as the pack leader for your dog, call the dog obedience training specialists at Alpha Paws today at 1-877-868-PAWS (5248) to discuss which of our dog training classes would be most appropriate for you, your family, and your pet.